Jeff Sullivan: Welcome, Travis, to your first FanGraphs playoff blog! It’s overwhelming! In what inning will the Yankees go to their bullpen? Brendon: Any thoughts on the winner of this game going on to face Trevor Bauer first instead of Kluber? Jeff Sullivan: Just in time for the first pitch, I lose my connection! Travis Sawchik: Where are chatting from, Jeff? Jeff Sullivan: I’m chatting from my office in Portland, Oregon. Yourself? Jeff Sullivan: Dinger! Leadoff dinger! Adam: My heart rate has been up for hours, Travis. Jeff Sullivan: Mauer with a pop-out, if that counts as a pop-out. He’s one of the least-pop-uppy players in all of baseball! J: How do you feel about Hicks in CF, Ells at DH and Headley on the bench? Long Live Jeff Frye: If this game goes deep into extra innings, would you think at all (regarding pitcher usage) about the next series or just try to do everything you can to win this one? Travis Sawchik: Isn’t Dozier supposed to be on the Dodgers? Jeff Sullivan: 15 pitches in, a mound visit. Warm up the bullpen! Travis Sawchik: I swear that sound is heightened … on-field mics? David Kagan: Does Servino always keep the ball up like he has? Tyler: How is Sano not on this roster he can pinch hit. Travis Sawchik: hey, remember when Girardi was asked about bullpen-ing this game? ChatzMcGee: Well… Twins it is. Kyle: Bring in the Chad! Christian: What’s you opinion of the ESPN strike zone box they have on their broadcasts? I really like it but people on Twitter are complaining about it. Factory of Sadness: If Severino gets yanked early and the Yankees somehow mount a comeback, what’s the earliest he could possibly pitch against Cleveland? Asking for a friend who always assumes the worst. 1992: Playoff baseball is better on the radio. Anticipation while waiting for the PbP to explain the result is amazing. Also, connects you back to how the support was consumed decades ago. Not a question, just a fact. Jeff Sullivan: Luis Severino is out! AdamZ: Why is there an off center camera angle? Wasn’t espn the first network to have the dead center cam? Conor : Dan schulman just called chad green the Yankees “secret weapon.” Chances he read your article Jeff? Ryan: Bullpen game after all! Sam: Thoughts on Pulling Severino in the first?? Jeff Sullivan: Right thing to do, with this much bullpen depth. Ask Travis! Seff Jullivan: Do playoff stats count towards the stats on your esteemed website? Nick: Jeff, do performances like this make you give any credence to the idea of rookie nerves? All right, it’s 3-0 Twins in the first. *NOW* who do you think will win? AdamZ: What world do we live in where the Red Sox are a low power/low k team and the twins hit dingers and K a lot? Ugh Sterling: Listening to the Yankees radio call. John Sterling and Susan Waldman are positively cackling that you commentator types didn’t predict two homeruns with only one out in the first. Do you like the one-game Wild Card format? Rick: When do they take Green out of the game? bosoxforlife: Sorry Travis, you are terrific but the drama of this one game is unbeatable and does not need changing. kevinthecomic: how many people picked the yankees going to the bullpen in 1st? Jeff Sullivan: It was 0% before Green came in! Fact Check: Obvious selection bias on the one-game wild card poll: you’re polling people who care enough about the one-game wild card game to join this live chat. JTT: Is this game the worst DH utilization in post season history? Ellsbury at DH and robbie grossman batting 9th. bert campaneris: I am here to read about Travis’ anecdotes about his basement. Get your facts right! AdamZ: I don’t think I can name a single person in the Twins bullpen. Travis Sawchik: Time to eliminate on-deck circles! Andrew: TV guys talking about pitch count for Santana…isn’t that completely irrelevant in tonight’s game? Travis Sawchik: Is Santana really sitting 96-97? Jeff Sullivan: Look at that! We’re tied! Anonymous: Oh right. It’s 2017. Home Runs. Nick: Why would you throw that pitch? Beel: Travis the doubleheader would give the WC1 team a much bigger advantage than the #1 seed gets. I don’t like that. Why do they deserve such a large relative advantage compared to the other playoff teams? Especially considering they didn’t win their division. Owen: You guys should take a poll of what the audience thinks that length of this game will be. Travis Sawchik: Minutes or innings? Galvanic: Hope this game ends 31-30 in the 12th inning. tommy toms: why do they call it “painting the black”? Travis Sawchik: Why is there a black border around the plate? Jeff Sullivan: I’m guessing…it’s…what the plate is mounted on? Alex: Travis, how hard is it for you to separate being a fan vs. being a journalist? EccentricChemist: So pretty much both teams are going to burn through all their pitching tonight and be screwed come Thursday? PitchClocksPlease: 1st inning took 46 minutes to play. Travis Sawchik: Jeff, how do you feel about a 9-hour chat? joseph: Twins only brought 11 pitchers. Enough or not enough? Josh R: Or with a laser strike zone it would still be 3-0. I don’t get the people that say “…but the human element.” Why would we miss human mistakes? Tucker: Jeff, Travis … what are we drinking tonight? Mike: Does this affect how the Yankees use Severino in the ALDS if they advance ? Travis Sawchik: Might he be in play for Game 2 now? Chicks Dig the Long Ball: Looks like Dave is going to get what he desires. This is basically a 0-0 bullpen game for the Yankees. Chaz Bono: If the Yankees’ and the Twins’ best players combined to form a super team would it be better than the Indians? Adam: Jeff, how do you feel about livechatting a game on pace to take 6.9 hours? Travis Sawchik: If you started the Ken Burns Vietnam documentary now would that — or this game — finish first? Uncle Jimbo: The black is there because the plate does not lay flat. The plate is raised and the black is tapered up to the plate from the ground. The black has to be a different color to differentiate it from the plate. bosoxforlife: Jeff, you west coast guys don’t know how tough those AM finishes are. Buck Showalter: This is a totally improper way to run a bullpen. You save your relievers for their proper roles, whether the situation comes up or not! Travis Sawchik: Send out a distress call ….. or was that your distress call? Chicks Dig the Long Ball: Jeff, being an outdoorsy dude living in Portland I figure you know a bit about weather. What’s your weather app/site of choice? Peanut Wilson: Can you name three other players in the deal that sent Didi from the Reds to the Dbacks? Travis Sawchik: Wasn’t that the Bauer and Choo deal ? AdamZ: This game is a perfect microcosm of 2017. Travis Sawchik: Buxton. Velo. Strikeouts. Home runs. Travis Sawchik: And Outs Above Average! Jim Golderman: Talking about DRS in a nationally broadcasted game… even just 10 years ago that was unthinkable. MaineBall: So would you say that Kipnis in CF is trouble for the Indians then? BossTon: Do you guys think Buxton is going to stick in the bigs this time? Cale: Jeff and Travis, when was the last time you went to a playoff game? Tom: Byron Buxton=Javy Baez of the OF? Michael: I think Buxton has 25 outs above average now. Miles: What do you think is the primary barrier to more advanced stats to entering the mainstream of broadcasts? Jeff Sullivan: They would be terrible!! Sharp: Are the components of catcher defense (arm, block, frame, etc) split anywhere? Uncle Jimbo: This is basically the alternate channel. Johnny Bench: if Gary Sanchez can’t block the plate, how did he save 8 runs on defense? Anonymous: What’s the cliff’s notes skinny on Berrios? Avi: Didn’t MLB stream a couple games as “MLB Now” last year and had the MLBAM guys on to talk sabermetrics on the broadcast? Supposedly the numbers were so bad, hence they stopped it almost immediately. Sharp: What role does CC serve being on the roster? Travis Sawchik: How many kids on the East Coast will see the end of this game? Jeff Sullivan: There’s that Buxton speed! Hugh: The MLB Plus whatever was terrible. Nerds fawning over spin rate and other saber stats and not talking about the game. Watching one of those gave me respect for all the real TV and radio guys. It’s a skill to weave a narrative and keep the audience engaged. Travis Sawchik: So Statcast Vin Scully? Travis Sawchik: What kind of class? Where? Travis Sawchik: Is that what August does? The @astros did tandem starts in minors. Ridiculed. Can’t be done. Travis Sawchik: Isn’t amazing how Green didn’t melt when coming into a game early? Christian: Why is Buxton so low in the lineup? Travis Sawchik: Who are the Twins going to start in Game 1 of the ALDS? Rosin Bag: Can Bartolo be activated for the ALDS? Uncle Jimbo: Do you guys get paid by the hour? Jeff Sullivan: Do we even get paid? Travis Sawchik: It’s a good deal! George: Berrios has wicked movement, especially on his fastball/2-seamer. Nick: Does run expectancy take into account the fact that the Yankees historically crush the Twins’ spirit whenever they get any sort of momentum going? Travis Sawchik: Wasn’t he supposed to have an advanced changeup as amateur? Mike: Is Sanchez the new Cano in terms of appearing like he doesn’t try while being very good ? Jack: Surely you guys get t-shirts?? Jeff Sullivan: Cano has more smooth. bosoxforlife: Nobody should complain about the pace of this game. Baseball is about tension and drama and this game has already had all you could ask for and it is the bottom of the 3rd. Jeff Sullivan: Would baseball games be great if they lasted 10 hours? Guest: On the announcer discussion: people don’t listen to announcers to hear a player’s stats. The announcers are there to tell stories. Stats belong in graphics, though, and it wouldn’t be too crazy to see something like wRC+ or WAR on the graphics before long. We do at least get OPS now, so there may be a slow movement in that direction. Kiermaier’s Piercing Green Eyes: O/U 4 hour game? Jagouar: What do you think of those big blue empty seats at Yankee stadium? Gee: When you guys wear baseball caps, which logo if any do they have? The Hamburglar: Who worked the super long Blue Jays/Orioles game last year? I remember that went very late. Daniel: Who’s going to be chatting tomorrow? Travis Sawchik: Jeff, do we get down days like Chad Green after 45 pitches? Jeff Sullivan: Try to fill the pages without us! Ha ha!! Post Malone: Yard goats?? You a CT guy? Jeff Sullivan: Their colors are sharp! Daniel: So you guys are admitting your content is just filler for the site? Travis Sawchik: Isn’t there a John Olerud-Rickey Henderson story that goes something like that? BPhoenix 2042: Love me some yard goats. I’m a CT guy. Thought the name was dumb at first but it’s growing on me. Sort of a goofy, lovable thing they’ve got going on. Nice stadium too. Travis Sawchik: Is this a real thing? bosoxforlife: I just took off my Red Sox hat and put my Yard Goats hat on. Blue and green are Hartford colors. We will never forget the Whalers. Jeff Sullivan: That ad sounds fantastic! Slider: Two more reasons it’s dumb to start Bauer in game 2: if kluber pitches game 5, there’s little chance he can pitch 3 games in the ALCS. And similar to Britton next year, they could lose the ALDS in four games only pitching kluber once, whatcha think? AdamZ: You can buy Whalers gear at Bradley airport. Post Malone: There was a FanGraphs meetup IN FANGRAPHS? How does that work? Jeff Sullivan: Oh, Travis, it’s going to be a long month. George: For me it’s not even about not starting Kluber, what happened with Carrasco? If you want to make the argument that Kluber goes on games 2 and 5 I could see it, but Carrasco is way better than Bauer so the decision not to choose the former is shocking. Matt: Very Mark Teixeira-esque stretch by Bird there. Erik: In case anyone wants to track it, the longest 9-inning game lasted 4 hours and 45 minutes. Through 3 innings, we were on pace for something like 5.5 hours or more. Travis Sawchik: You mean, March? Travis Sawchik: What happened to Buxton? Evan: Why isn’t there some kind of shock absorber system for the outfield wall? Chris G: walls are hard…. Jack: I was living in DC at the time and can confirm, that commercial is a real thing that actually happened. I always imagine Nick Johnson feeling vindicated whenever the spot aired. Mark: Why doesn’t cashman get more credit on a Theo-type level? Is it just a payroll thing? Adam: Buxton did leg out a potential DP ball in the third, after that wall crash. Odd. Concussion effects maybe? billsaints: Have them like the the walls in trampoline parks to help even out the juiced balls. CarrotJuice: Should the Yankees get that level of credit? Travis Sawchik: What was the time stamp on that, jeff? Anonymous: Well, that felt sort of inevitable! Nick: Man, screw the Yankees. Show Hey O’Tawny: Is that it for the Twinkies? Travis Sawchik: Remember when Aaron Judge was struggling to make it on top 100 prospect lists in the preseason? Nick: The Yankees beating up on the Twins for the last 14 years kinda disproves the notion of karma. Anonymous: Dillon Gee sighting. October Baseball! Josh: Given the bullpen differential, the Yankees just have zero excuse if they lose from here on out, correct? CarrotJuice: If Judge only hits it 386 feet, should it even count as a home run? Post Malone: Some places had Clint Frazier power greater than it equally to judge…. Travis Sawchik: We’re not impressed, Aaron! Jeff Sullivan: Right? I, for one, love going home! 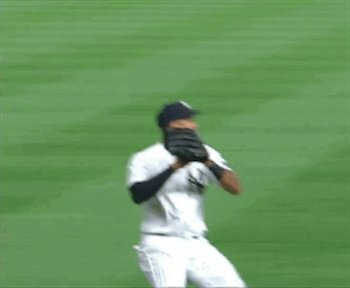 Srhkthew2: In a 4-1 game we’d think the Yankees were flat out playing them. 7-4 feels like they’re out playing them but lucky too. 13–10 we’d think they were just lucky. Why that perception? Korey Cluber: This game has gone on for two hours and it’s the bottom of the fourth. Post Malone: Auto correct is making me look illiterate on some of these posts. Nathan: Are you predicting immortality for the Twins? a: people who complain about autocorrect: why don’t you just turn it off? Jeff Sullivan: I will not. I assume Travis will? Travis Sawchik: Including Game 1 of the ALDS! Jeff Sullivan: Which won’t have Corey Kluber in it! B. Ryce Hammer’s Luscious Locks: Man, this game just seems hopeless for the twins all of a sudden. Brian: Does Judge produce more batspeed than other players? jumpstartation: Who do in-game interviews appeal to? Does anyone actually enjoy them? Babe Lincoln: Crowdsourcing because FG > rest of internet: anyone know an easy way to get shoe polish off your hands? Just shined my shoes before an important meeting tomorrow, and now my hands are covered in black gunk. ChatzMcGee: Stanton had the fastest bat speed according to StatCast. Jeff Sullivan: Hey we’re halfway through the baseball game! Jeff Sullivan: How you holding up, Travis? AdamZ: There is very little more deflating than a first pitch pop up. Mike: Why would you type this shoe polish question into this chat instead of google.com? Babe Lincoln: So most sports people used to play are extinct (e.g. gladiator stuff, things we’ve never even heard of), and most of the rest are clearly dying (e.g. boxing). Stands to reason that modern sports will eventually die too. We know how football will die (concussions). How will baseball eventually die? binder: who should come in next for the Yanks? The Hamburglar: Any offseason vacation plans for you guys? caesar_solid: Does MLB have to wait for the next CBA to implement any new directives aimed at improving pace of play? Beel: But why Bauer over Carrasco? I don’t get it. J: How is Berrios still in? No better RP than the 2nd SP? Travis Sawchik: Maybe they wanted Carrasco to start first road game? Danny: Bauer’s arm is more durable and probably better with short rest. Jeff Sullivan: Quick easy inning for Berrios. To the sixth! Mac: Could Bauer be put in the bullpen for his side day for an inning or 2 later in the series? He’s always saying he could pitch every 3 days. Long Live Jeff Frye: Managers exist solely to absorb radio call-in anger that would otherwise be directed at the GM or ownership. They are rage buffers. Christian: Do you guys moderate the chat as well as participate in it? The Hamburglar: Would MLB be improved if they had their managers dress in full suits? Jeff Sullivan: Single for Granite! It’s happening! That Guy: Would you pitch Severino in game 1 or err on the side of caution and wait till game 2? Jeremy : Eddie Rosario now has a HR in his first ever AB, his first ever pitch hit AB, and now his first ever playoff AB. Jeff Sullivan: Even Eddie Rosario gets a fun fact! Daniel: why does jose berrios get below average sw/str percentages this season? i feel like his stuff is too nasty. is he forever a strikeout-looking fool-you-outside-and-come-back-in type pitcher? Bryan: Surprised Robertson still in? Bryan: Southern Tier brewing. Yay or nay? Spoiler alert: I am drinking their thick mint imperial stout. It’s a girl scout cookie in beer form. MaxRobespierre: I know this feels like an Eno question, but what sort of adult beverages are you enjoying at the moment? Mark: Is Robertson low-key the second best Yankee reliever? Travis Sawchik: It’s not half bad! Jeff Sullivan: This is not the answer but the statement is correct! Beel: Who saw Robertson pitching more innings than both SP combined? Travis Sawchik: Girardi knows he has five other dudes like this, right? Simon: Robertson has thrown more pitches than either starter, and more innings than both combined. Bryan: Bigger upset: Yankees over the 115 win Mariners team in the ALCS or the Yankees/Twins over this years Indians? AdamZ: Has a pitcher ever said “I’m gassed, take me out skip” when asked by a manager if he is good to go? Jeff Sullivan: Rarely, but it does happen! Fake Eno: Oregon tap water; earthy undertones, small hints of flouride, better finish than Idaho tap water. joseph: If the Twins don’t punish Robertson/Girardi, it’s time for sleep. Danny: Very impressive outing from Robertson, but it would be very fun to see a three run homer here! Confused Englishman: Can we bring in 2009 Joe Mauer for this at bat? Jeff Sullivan: 10 more feet and we’ve got a tie game. As is, we do not have a tie game at all. Nick: Why aren’t nice things allowed to happen to the Twins? That is… a ton of curves. PitchClocksPlease: Being the first team to go from 100 losses to the playoffs isn’t a nice thing for Minnesota? Jeff Sullivan: If this is your first time watching Hildenberger, watch for him to come over the top with a surprise heater around 92. Fun twist! Andrew: What does the Twins offseason look like? BPhoenix 2042: The breaking ball revolution is more interesting to me than the fly ball revolution. I love it when pitchers throw the bendy stuff more than the straight stuff. Jeff Sullivan: Check out his minor-league numbers. Very good! Gary: Who the hell is Hildenburgman? Mike: why even compare pre 2-WC post season records vs current ones (like 100 loss to made playoffs)? Post Malone: Think Twins take a step back next year? George: Do the Yankees also have the highest fastball velocity average out of the bullpen? Like ever? Chad Green was sitting 97 and he’ll be the second slowest pitcher the Yankees will throw out today after Robertson. Travis Sawchik: Sixth on record… How about those 2014 Cardinals? Grue: If they actually get good pitching in the offseason they could repeat the second wild card maybe, right? This isn’t a great team the Twins have, but thats mostly because of the pitching. Confused Englishman: 2014 A’s bullpen similar to 2017 Yankees? Dan: Why is chosen shreve warming up…. Confused Englishman: Is there any example of 2017 Yankees blowing any game similar to what they need to do now? TheRaysSeemedBetterThanUnder.500: Not sure if you brought up the 2014 game because of my earlier comment but I’m glad I’m not the only one thinking about that game! Danny: When you guys say they should bullpen, is that to save the starter for the division series? Because if you really want to win this game, I think it makes sense to go with your best pitcher, even if you do pull them after several innings. MaxRobespierre: I know as writers you guys have been detached from your favorite teams out of necessity, but are you/were you a Cleveland fan (I ask Travis to avoid Jeff and the Mariners). How do you feel about the team’s success lately? I ask because I understand Ben Lindbergh is at the game tonight and I wonder if he feels Yankees fandom welling up in his veins. Babe Lincoln: Sad for Ben. Think he thinks it’s worth it? jake: the lessening of fandom is obviously necessary for many in your line of work, but do you ever regret it? AdamZ: Three certainties in life: death, taxes, and the Yankees knocking the Twins out of the playoffs. Guest: Yankees fans should never feel any joy. This is simply a result of the massive resource advantage their team has. They should feel a vague satisfaction when they win a championship, and bitter disappointment if they don’t. Jeff Sullivan: Thank you, luxury tax! Adam: By that logic, if the dodgers win this year, they should just walk off the field silently. Jeff Sullivan: Speaking for myself, I’ve lost a lot of the emotional fandom, but I’ve gained a lot in terms of how much I enjoy actively thinking about baseball. Travis Sawchik: Hey, act like you’ve been there before, right? Bryan: Jeff do you read up on corsi and other NHL fancy stats? That Guy: Just a reminder that the Yankees haven’t had a sub-.500 season since 1993. This despite turning over the roster multiple times in the era of FA and spending last year selling for a “rebuild.” The Yankees hate is still completely warranted. Guest: What is the reason that playoff WAR doesn’t exist? Danny: I like the tribalism of cheering for one team, and baseball is fun to talk about a lot! It’s hard imagining losing that. Guest: Is UZR it? Because I don’t see “Off” and “BsR” on there either. RJ: Biggest reason for no playoff WAR : what’s replacement level? Jonas: Can Severino start on Friday? Aer: that’s the second time gary has stepped out of the box before the pitch is caught. why? AdamZ: The best part about caring about one team is going onto message boards and bitching about how horrible they are all the time regardless of their record. MaxRobespierre: I’m so detached from individual MLB teams that I usually cheer along with the home team’s fans whenever I attend a game, regardless of where it is. I can get pumped for that, and the experience is fun. NtflxnRichHill: Which one of you could name more players on the Padres’ 25 man roster? Tim: Do you guys remeber when Travis said Judge wasn’t clutch and Gary wasn’t that good? Guest: Is there a reason that the black box stats can’t and won’t ever exist in the playoffs? Something about controlling for the league environment? Or do they just currently not5 happen to exist? Travis Sawchik: Sanchez, well, I’ve been eating crow for several months. That’s fine. Babe Lincoln: Jeff, any recommendations for a good volcano book (besides Krakatoa)? AdamZ: Jeff and Travis, what are your worst takes (in hindsight) you ever put into writing? NtflxnRichHill: My wife just looked at aaron judge and said, if I cover his face, that’s what your body looked like when we got married. Jeff Sullivan: What a huge strikeout by Rogers. Twins might escape this yet! Crusty: Yankees fans: ready your pitchforks for the march on Travis! Jack: Jeff: Dante’s Peak or Volcano? MaxRobespierre: I assume Travis will be at a playoff game this postseason. How about you Jeff? Plans to attend any? Or is it too inconvenient geographically? That Guy: It really feels like Sanchez went under the radar this season. He’s already the best catcher in the AL, yes? Danny: You should have played baseball. Jeff Sullivan: And Busenitz walks in a run. Travis Sawchik: Thanks! Upper deck in the new generation of stadiums have pushed a generation of middle-class fans very far away from action. I hate that. Girardi: Have I managed this game well? Travis Sawchik: Anthony, what kind of vibe are we giving off? Jack: Wait Columbia Class? ?, link? libre: Who is the best CF in baseball? Is Aaron Hicks under the radar in that discussion? Jeff Sullivan: What? Trout? What? libre: New Yankee Stadium is a great example of the upper-deck far-away rich-playground thing of Travis’ piece. libre: Who is the best baseball player from each state? Ellsbury the best Oregonian? Jeff Sullivan: We’ve got Dale Murphy and Mickey Lolich! Bean: At what point does a switch hitter with bad splits get asked to just hit from one side? Said hicks .310 from right side vs .240 from left. Expected to hit sub .240 from right side vs righties? Jeff Sullivan: He didn’t step on the base! Travis Sawchik: What kind of household item is Granite? Travis Sawchik: How do umpires keep focus in a game like this? Anonymous: What’s the article on this game about? libre: You answered three of my things so I think the queue is much more empty than it was earlier. You guys should stop. Jeff Sullivan: Can’t stop! Dave will fire us! Jeff Sullivan: And now pulled-pork tacos have arrived on my desk. This evening is looking up! Stephen: I’m starting to think the Yankees might be pretty good? With this kind of bullpen usage, they might put up a pretty good fight against Cleveland. BPhoenix 2042: Having just read that piece comparing the mariners to random household items… i am in love. Tim: How in gods name is Matt Belisle a closer on a playoff team?!?!?! Anonymous: Was this a bad game? Brett W: This game might finish under 4 hours, which is actually amazing for a game in which the 3rd inning doesn’t start until 1:35. Rick: I would have bet almost any amount against this game ending before midnight (eastern) if you’d offered it to me in the 3rd inning, yet it might actually happen! Josh R: Several Yankee relievers racked up a lot of pitches tonight. Will this end up mattering in the next series? Bean: Okay so Hicks is a bad example, but do teams pay a lot of attention to that on a per season basis? Do they ever tell the batters to stop and hit from one side? Or ultimately up to player? Kevin: bullpen WC game strategy proven (if accidental) – does this break the ice? Nick: Are the Yankees an ALCS favorite if they make it past the Indians? 100 win team by baseruns that looks to be even better than that in the playoffs. MaxRobespierre: Im new to FG live blogs. Wondering what the chat schedule is this week? Will both of you do the live blog again tomorrow and the rest of the playoffs? Or will FG Staff rotate? Josh R: Seriously, a team can’t really win post season series with Fernando Rodney closing things out, can they? Jose berries n cream: Where would you put judge on your trade value list if you made one? Brett W: Did Cleveland win tonight? Judge homers: Is there a way to see where the ball would land if there was no stands? Would he be crushing 600 foot bombs? Brett W: If somebody offered you $5,000 to either drop a baseball off a 25-story building through a basketball hoop or strike out Aaron Judge, which do you choose? Hank: Who has the better bullpen, Indians or Yanks? caesar_solid: does BaseRuns adjust for strength of schedule? Jeff Sullivan: Who do you think they’ll use more — Clevinger or Salazar? gibs: Now where would you put Stanton on your trade value list? Jeff Sullivan: Written about at The Athletic! Travis Sawchik: Severino-Kluber for Game 2 anyone? Jeff Sullivan: Alas, it’s ended! 8-4 Yankees. TheRaysSeemedBetterThanUnder.500: Thanks for chatting guys! Jeff Sullivan: Thanks for chatting with us, y’all! Jeff Sullivan: And thank you Travis! Travis Sawchik: Thank you, Jeff! Travis Sawchik: Who is turning out the lights? Jeff Sullivan: I got it! We hoped you liked reading 2017 AL Wild Card Live Blog by Jeff Sullivan! The 2014 Cardinals bullpen velocity is very skewed since Neshek and Choate don’t seem to register on there at all.